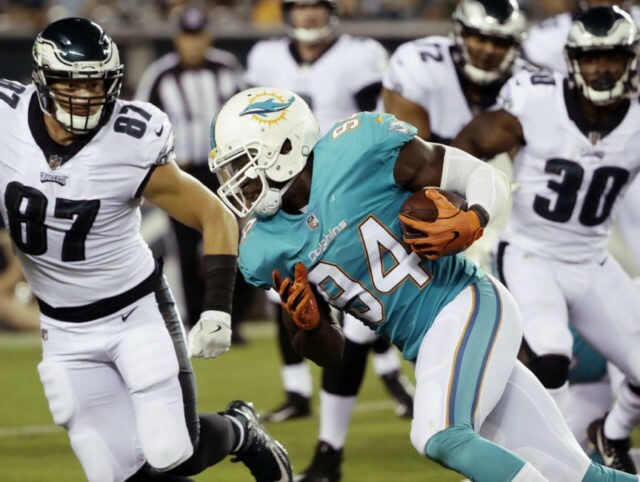 MIAMI (AP) — The Miami Dolphins’ vanishing linebacker is back. Miami lifted the suspension of Lawrence Timmons after one week Tuesday, and he’s eligible to play Sunday against the New Orleans Saints in London. Timmons was suspended indefinitely after he went AWOL the day before the Dolphins’ season-opening win at the Los Angeles Chargers. The Dolphins filed a missing person report before making contact with the 11th-year veteran, who apparently was dealing with a personal matter. Coach Adam Gase was angered by the disappearance of Timmons, who wasn’t with the Dolphins at their opener and didn’t fly back to South Florida on the team plane after Miami’s 19-17 win. The game was the first Timmons has missed since 2010. He wanted to rejoin the team last week, and several players said they would welcome him back. Linebacker is perhaps thinnest position for the Dolphins, who were again without Timmons when they lost Sunday at the New York Jets, 20-6. Timmons signed a $12 million, two-year deal in March after 10 seasons with the Pittsburgh Steelers. To make room for the reinstated Timmons, the Dolphins waived linebacker Justin March-Lillard.